With yesterday’s lack of fundamental news on the economic calendar it was hardly a surprise to see the euro dollar trading in a very tight range and closing the day marginally lower with small wicks to the top and bottom of the candle, probably as a result of profit taking following Friday’s surge higher in the currency pair. Today’s price action has continued the upward move and we should now see the euro dollar attack the 1.40 price point in the next few days, particularly as the US dollar index is now showing continued and generalised US dollar weakness with the only caveat being a major fall in equity markets which could cause a temporary slight to the safe haven status of the US dollar. With all markets now characterized by traders’ attitudes towards risk in some respects the influence of the fundamentals is secondary in nature with most markets apparently trading on sentiment rather than fact of which the oil price is a classic example. My suggestion for today, therefore, given that all three moving averages are strongly supporting a move higher is to open long positions with a view to holding these for the longer term and as the trend develops to add to these positions on any sustained break, particularly as we have now broken above the 1.35 price region. 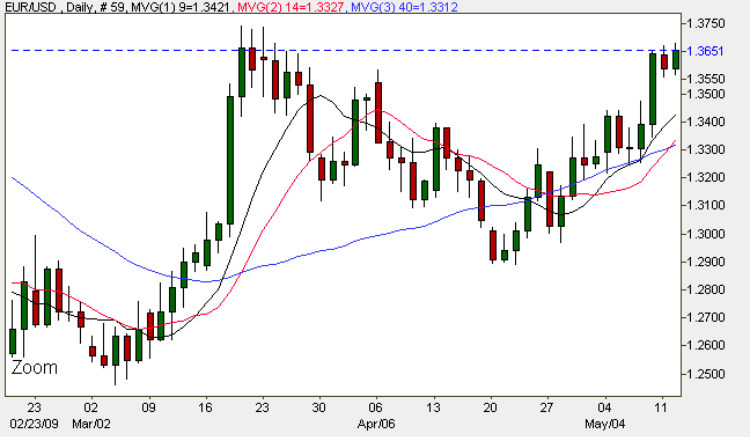 I would also suggest placing any stop losses below the 1.3140 area.